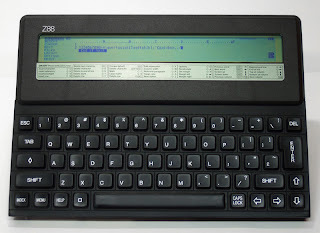 Palmorama: Z88 An early predecessor to the PDA? I must be getting old, because this actually looks completely cool to me. The Z88 was designed by Clive Sinclair in 1987, and closely resembles a ZX spectrum. It had a built in word processor / spreadsheet / database on board, and as far as I can see there is still a relatively active community.